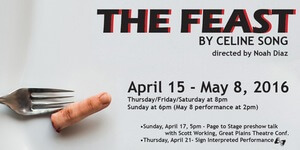 Exceptionally skilled acting at Shelterbelt Theatre makes The Feast by Celine Song an impressive display of talent. And it appears that director Noah Diaz has done much to make the piece provocative. This unusual and far-out script looks like a worthwhile experiment whose recipe is still in the trial-and-error stage. The script has so many slightly connected ideas and variations on the essence of the matter that the effect resembles a diner’s 20-page menu that could make the customer wonder if the many cooks required could have the know-how to make all those dishes worth the visit. A broth. It can’t be discerned what Diaz has added and what Song put there herself about interpretations, staging, and focus. Hovering not much out of sight, given advance info, the prime subject is cannibalism. That fundamental premise sounds like a nourishing one: a contemporary, newly meatless society trying to cope with the alternatives. Such a theme sets up the possibilities for thought-stimuli. And plenty fly by during the 80-or-so minutes. So do many others which seem more peripheral. Song’s notes, for example, refer to, among 17 topics, seeking “clarity” about privilege, aging, intimacy, animals, cruelty, machines, brains, love. Try to spear them, if you can, while the pot is bubbling. Further, there’s a surprise element waiting in the wings. It suggests that Song is taking a stab at Waiting for Godot-ness. Certainly, as the tale reaches its consummation, this crosses over into another dimension of sight and sound, akin to The Twilight Zone’s “To Serve Man.” A further point about cannibalism is added to the others piling up on the table. Incipient dinner is the centerpiece at the home of Francis and Wendy Darling. Yep. The name of Peter Pan’s girlfriend. The guests are married folk Rhett and Sam. Vivisectionist-researcher Xander is the third visitor. The meal is on hold until saintly Francis comes home from performing surgery in a hospital. You can already see that the situation and dialogue come loaded with pointed stuff. As the conversation keeps on being served up, anxiety builds about when the meal will actually be consumed. Tension mounts. After the preliminary issue about fresh sources of meat is discussed at length, savagery ensues. The guests are stripped down to underwear. Rhett and Sam spend much noisy time trying to relive their courtship, getting freakier. Xander and Wendy toy with each other’s libidos. The guests mark up each other’s bodies with lipstick and colored pens. Xander speaks in a tirade sounding like Beckett’s Lucky. Etc. Etc. Meanwhile, cellist Hannah Meyer adds wordless musical moods and emphases. SPOILER. I assume that not listing Francis in the program book, nor the name of the performer, is deliberate. Make your own conclusion as to the reason. Anyway, finally Francis arrives. He summarizes issues, symbolisms, and presumably deeper meanings derived from previous dialogue, adding something further. All this is played bordering on reality, bordering on insanity. As Wendy, Mary Kelly performs the incredibly extended, expositional, ruminative introductory monologue with astonishing ability, full of color, humor and personality. A major accomplishment. Thereafter, she keeps the character wonderfully dotty and charming. Beau Fisher has a standout scene of his own: an extraordinary rendition of Xander’s mental breakdown. Leanne Hill Carlson stays vividly alive and convincing as Sam, while Noah Diaz gets across well-developed variety portraying Rhett. SPOILER Part Two. Brennan Thomas does a fine job giving Francis holy intelligence. Song has had this play produced elsewhere after an initial reading at 2014’s Great Plains Theatre Conference. It would be interesting to learn what alterations have occurred since that Omaha performance. It needs more. Of course, no animals were harmed in this production.